Actually, it began some time ago when my daughter got engaged. I was thrilled when she asked me to make her wedding dress! 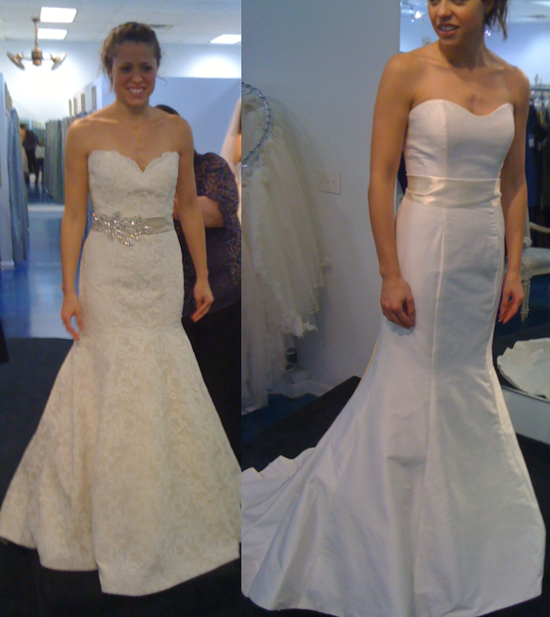 I love to sew garments and my favorite thing of all to make is bridal gowns. I have probably made close to 25 gowns during the few years I was a custom dressmaker. Our first step in this process was to narrow down exactly what she wanted. This was a task in itself! Jessica sometimes has a hard time making up her mind and she sometimes changes her mind, which makes me a little nervous. She, of course, pored over all sorts of bridal magazines to help narrow her choice, but there is nothing like seeing the gown on your shape to help you decide on the final style. So she tried on all sorts of gowns at many different places. I want her to be sure that the gown I make her is EXACTLY what she wants. She tried on romantic gowns, traditional gowns, dramatic gowns, frilly and lacy gowns, plain and simple gowns, and some that were bedazzled with beads and sequins. 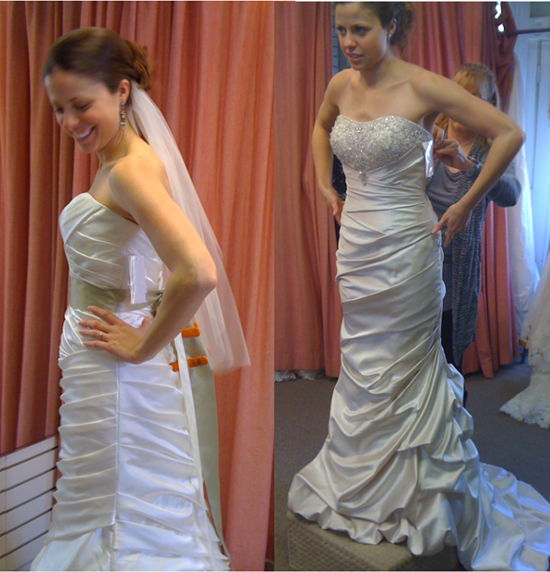 She has finally chosen the style and we are ready to begin the gown! Just a few tips on this process: Be sure to take a measuring tape with you to measure the length of the train, flare of a skirt, and other garment details. A camera, of course, for keeping track of all the styles is very helpful. 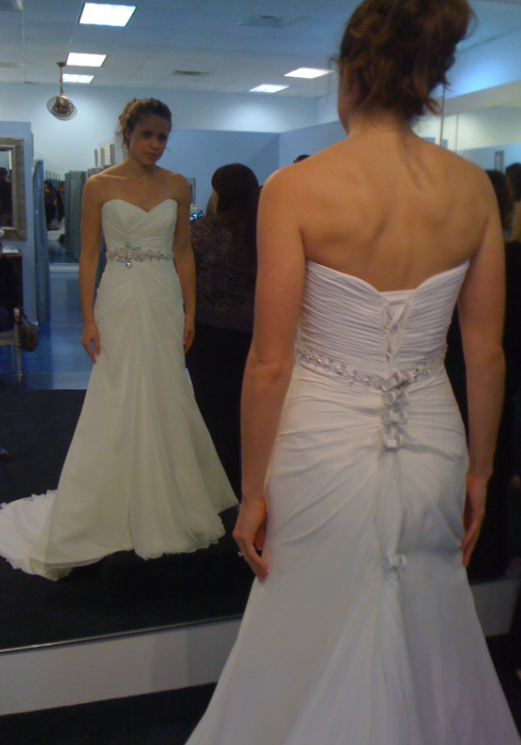 If you can take pictures of the front and the back view by using a mirror, this helps give you a good perspective of the gown. Also, close-ups of any special features of the gown may help, too . A notepad to record the manufacturer’s name, fiber and fabric information, any special garment details, and price of the gown will help you later when you piece together the ideal gown. Make note of the construction under the dress as well—petticoats, interfacing, and boning. 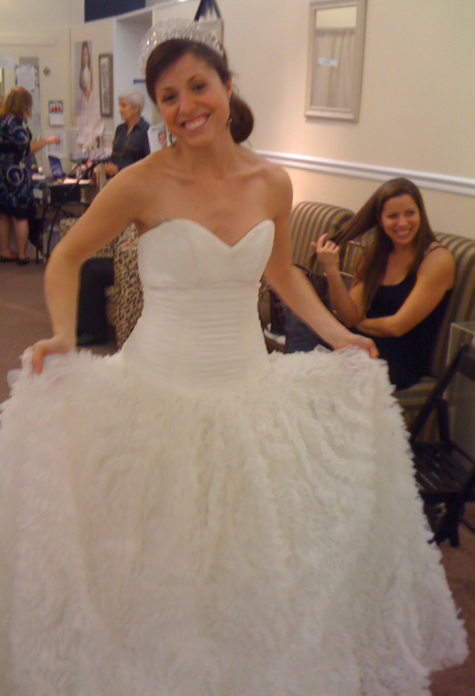 BTW, most bridal salons do allow picture-taking. 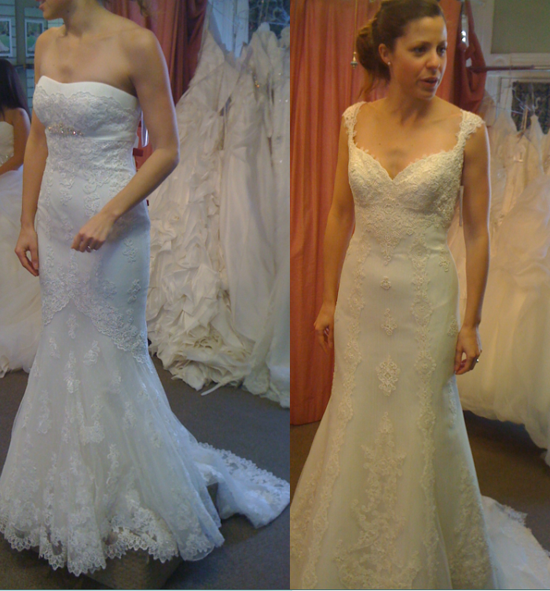 Now on to the next steps….taking measurements and making the test garment. My next few blogs will be about the process of making this very special project for a very special daughter on this, her special day. 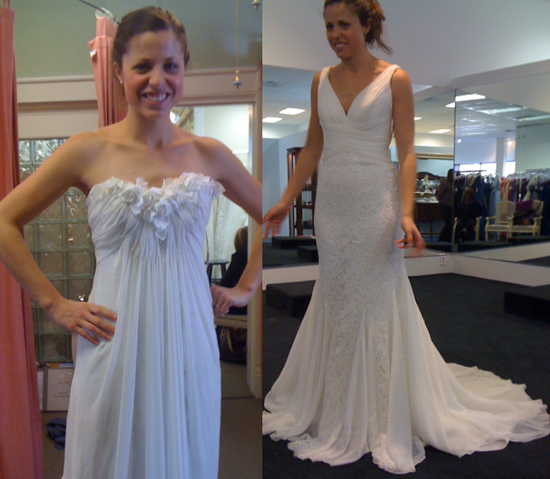 I take exception to your instructions to go to bridal shops and try on dresses. The stores are there to sell dresses. The clerks are paid when they sell a dress. When you take the clerks time and cause wear and tear on the gowns you are doing nothing short of shoplifting. Taking pictures is even worse. You have stolen from the store and the designers of these dresses. Shame on you and shame on Bernina to publish your suggestions. I give credit to We All Sew for allowing a criticism post to stand, but I think a rebuttel based upon economics is in order. This article from Forbes magazine points out a strong downward turn in the wedding gown industry since 2007. This has been going on now for 5 years, and there is no relief in sight. Even in the best of times– a bride can not get a true view of how she really looks in a gown from all angles, without photos and photo comparisons to review side by side. The shops should allow photos. Women shouldn’t buy such an important piece, or a multiple thousands keepsake item without every confidence and self assurance. All of the above said- these are tough times. If you have a mother or loved one so blessed with a reliable machine, large heart and the technical knowledge to provide your dream according to “austerity measures”– as the times call for, then call yourself blessed. And if you work in a dress shop, own a business or have something to sell– then start using your right to vote and your voice to help get the governments boot off of the neck of business. Looks like an exciting project can’t wait to see it unfold! How exciting! can’t wait to see each part as your project progresses. I just noticed the August dates- can’t believe i hadn’t seen this earlier.